Aegina Greece is a green island known for its great production of colorful pistachios. The Greek Island has a lovely capital full of fine neoclassical buildings and narrow alleys where one can enjoy fresh fish and excellent appetizers in the taverns of the fish market, in the heart of the town. The 5th century BC temple of Aphaia can be visited; it is located in an area full of olive and pine trees, overlooking the deep blue sea. On the Southern edge of the island lies the small fishing village of Perdika. This is one of the most picturesque spots on the island and still has the characteristics of the Aegean Sea-style of square houses and narrow streets. Try one of the many restaurants to eat fresh fish, surrounded by a beautiful landscape full of big pine trees and calm beaches. For swimming you can choose the sunny pebbled beach of Klima, located on the south side of the island. Luxurious Poros is small in size but generous otherwise, morphology wise looks like an amphitheatre built over two hills. It feels like a coastal town, as its separated by the Peloponnese only by a narrow sea channel known as â€œlittle Veniceâ€. Lush pine trees vegetation, crystal clear beaches, a lively waterfront adorned with shops, cozy cafes and restaurants, a charming capital (it has been declared protected settlement) with grand traditional mansions and pictorial cobbled streets, as well as a wide selection of entertainment venues are the ingredients of this quiet, yet cosmopolitan, destination that attracts visitors from all age groups. Cosmopolitan, historic and elegant Spetses lies at the southeast of the Argosaronic Gulf. It was named by the Venetians isola di spezzie, aka the island of scents. Its history, however, is much more exciting than that. 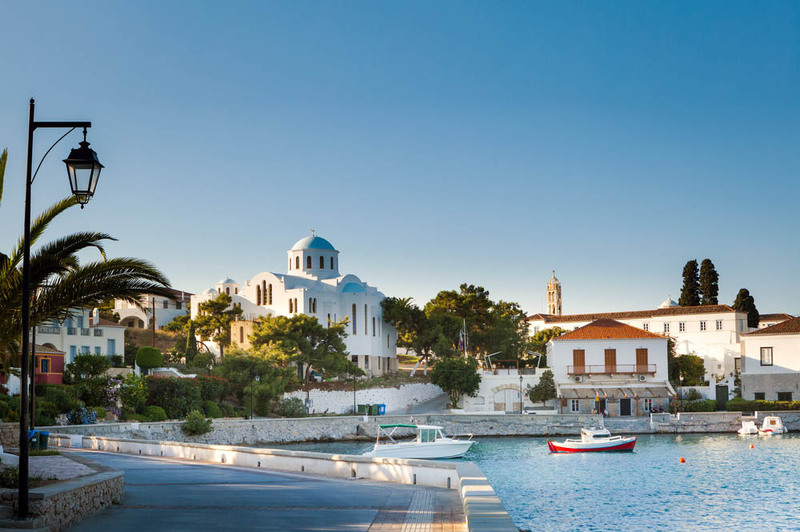 Spetses is one of the Greek islands that played a major role to the Greek Revolution of 1821. Moreover, Spetses was the birthplace of famous brave woman Laskarina Bouboulina, whose former house is now a private museum and statue stands proudly at the port. Canons, neoclassical buildings, old houses and captain mansions remind the glorious past, together with the numerous romantic horse carriages of the island. Cars are not allowed in Spetses, therefore transportation is carried out by buses, bicycles, scooters and mopeds. The most developed part of the island is its town, Dapia, with the port, the Hotel Posidonion an architectural gem at the waterfront-, the cobblestone streets and the busy square Platia Rologiou, among others. Meanwhile, the nearby Old Harbor (combining yachts, restaurants and nightlife) and the village Kounoupitsa (a colorful place of another era) are the main attractions. Spetses is covered in pines that reach up to its lovely seashores. Accommodation amenities are more than satisfactory and the island’s gastronomy is superb. It is considered to be a rather expensive island, but generally it corresponds to the â€œvalue for moneyâ€ criteria. History, architecture and tradition create a unique fusion in Hydra, one of the most cosmopolitan Greek islands. The island’s 18th century architecture is one of its trademarks. Grey stone manors blend with red tiled houses in white and blue, while the amphitheatrically built town features a lively waterfront cafes and restaurants day & night boulevard. Hydra differs from the majority of Greek islands in other terms, too. The road network is very limited, while the beaches are few and rocky, due to the mountainous landscape, ideal for yacht charters. Moreover, all types of motor vehicles are prohibited in the island, so the best ways to get around is on foot, by donkeys and water taxis or your own private yacht. Despite the above, and the fact that it is a pricey destination, Hydra is extremely popular among Greek islands. Its serene, sophisticated atmosphere attracts visitors from all over the world, as well as Greek weekenders and day-trippers, as it is close to Athens. The island offers excellent touristic infrastructure and preserves a strong sense of tradition. It also has the reputation of being the artists favorite: In the 50s and 60s it became popular among poets, painters, musicians and celebrities from Greece and abroad, such as Leonard Cohen, John Lennon, Peter Ustinov, Melina Merkouri etc., while the film Boy on a Dolphin starring Sophia Loren was shot here. Hydra itself is an island who yet refuses to give up on its origins. It remains a wild beauty, chic and unspoiled, reflecting Greece at its best. Discover Argo-Saronic in Med Waves selection of yachts.